Last week the news came down that the AAF had closed down shop. It had seemed so promising and I admit it was exciting to have some football when nothing else was going on. Then when the league needed an injection of money, games weren't shown on regular network tv etc, you had to know it wasn't long for this world. So now we wait for the CFL season to start... But wait...the CFL is boring you say? At least that's what Ben Volin thinks according to his article Failures of AAF a Predictable Call. Well, Ben if there's one thing CFL fans do, it's defend the league they/we love so much so thanks for the apology but no thanks. These are my 5 reason the CFL beats the AAF (and any league really). 5. The CFL doesn't proclaim to be a feeder league for any other league. The Canadian Football League is it's own league and doesn't try to be anything but. Yes, players sometimes come to Canada and become well known and then return to play in the NFL but that in no way influences the purpose of the CFL to provide Canadian rules football to it's fans. If you like high scoring, down to the last second, chew your nails off excitement then the CFL is a league for you. 4. The CFL is a small league. Because there's 9 teams (soon to be 10) spread throughout the nation it's easy to form a loyal allegiance. Many of us are born into fandom. It was difficult to choose an AAF team to root for and I found myself simply choosing a team based on who had the most ex Roughriders. NFL fans didn't even give the time of day to AAF so no one there chose a team. How do you choose a team when the league is brand new and you have less than zero feelings about it? 3. We were all afraid that the AAF was going to steal CFL talent from under our noses. That never happened. It did give some players an opportunity to play who wouldn't have gotten a shot any and otherwise. Let's remember that CFL players need to be great athletes. There's not only the Waggle to contend with but a lot of other movement that other leagues do not have. You have to possess great endurance and skill to be a great CFLer. 2. The Rouge. Some people don't like it but it can be used as strategy and I think that is the real essence of the CFL. There are subtle rules which set the league apart from others and those same rules make the game far more exciting during regulation time and in over time. The rouge itself can prove to be the difference between winning the game or heading to overtime. 1. TSN. The main reason the CFL is so successful is because of the big TSN deal to broadcast all games bringing the game into our living rooms and hearts. Even if you are a fan of one team you can watch and follow all league games easily. You can stream them on the TSN apps and webpages as long as you have a cable subscription. Because of such a great tv deal, the CFL is visible to anyone who wants to watch it. If you liked this blog post you might also enjoy a previous post titled 5 Reasons CFL Trumps NFL. 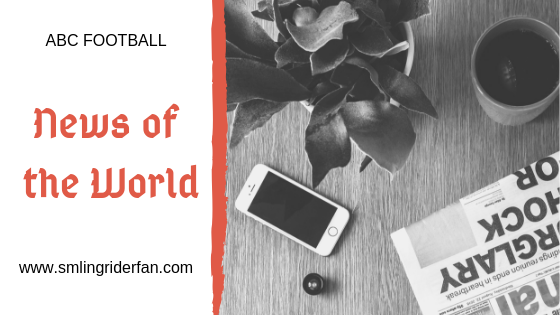 Need more football in your life? Don't hesitate to look up ABC Rider Fans on Facebook and join a great bunch of fun loving Rider fans. Is it just me or has March felt like it was 60 days long? No matter as we will soon be in the glow of the upcoming season and all will be right in our world once again. 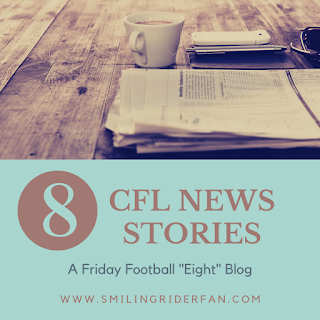 In the meantime, let's have a look at what the top 8 CFL stories were (in random order) over the last month. 1. The Randy Ambrosie Tour. The Commissioner of the CFL visited each franchise city to connect with management, fans, season ticket holders and who ever else wanted to gain insight. He talked (hyped) a lot about CFL 2.0 and what that means for the leagues future successes. 2. The CFL & Players Association met for talks over 3 days and pretty much nothing was accomplished. At least, there's been no news and not even any rumours floating around. The current CBA expires May 18th so there's still plenty of time to get things worked out. Us fans are antsy and would like things settled sooner than later. 3. Ratio Ga Ga. There was a massive discussion surrounding the ratio rules of the CFL's Canadians but also about the proposed amount of Global players. What we did see was an outpouring of CFL players posting their thoughts all over social media and often getting in arguments with each other or fans which was pretty embarrassing. 4. The Combine was held. I was otherwise distracted...Life, but thankfully I had some great people (John Strutt) who kept me in the know or at least updated about what was happening. I understand that the Combine is like a coming out party for possible players because it gives perspective teams a chance to view their skills. What I've always failed to see is how that might make someone a great player in the end, but that's just me, there must be something to it because it's done. It's important to note that this was the first time Global players were invited to attend and because of that there was gained exposure from both their leagues and Canadian media. 5. Mosaic Stadium was going to be home to an NFL preseason game...on second glance, nope it's not...or maybe yes? Between this and Olive Garden my Twitter feed was full of the ying yang of polar opposites. Some (John Gormley) wanted to say it was the Riders who put the kibosh on the event but when they later put out a statement about how the turnaround from an NFL field to CFL field less than 24 hours later, well I believe them and let's all be honest here...would you have really gone to see the Raiders and Greenbay's 3rd stringers anyway? I know I likely wouldn't have especially when I'd have to travel again the next day for the Rider game. The NFL was at first reported as unwilling to change the date and was looking elsewhere, like Winnipeg and Edmonton. Fine with me. Bob Irving also posted his thought that CFL franchises should be pulled for supporting an NFL game...Come on Bob! We are versitile people and can enjoy many forms of football in the world! For the record, I also welcome Olive Garden. The more choice the better. 6. The Alouettes are for sale. Firstly, the report was denied but then the truth came out as it always does. It's seemed to me for some time that their owners had lost interest in what was happening with their team and so I'd think new ownership would inject a much needed infusion at a time when they desperately are in need of it. What is curious is that the CFL wants to be the middle man here and take it off the Wettenhall's hands before selling it to...? Call me crazy if you'd like, but isn't this akin to Trudeau buying the pipeline? 7. Remember when we all felt the CFL was threatened by the AAF? Well Wednesday there were several stories about how the league is out of money. There was a multitude of potential here and I think had they secured a TV deal that allowed us all to watch instead of having to subscribe to yet another channel or streaming option most of us forgot about following it all together. Without exposure, there's little desire for anyone to attend the games and there have been some dismal crowd shots of the games that even make the Argonauts chuckle. Let's not forget that Johnny Manziel recently signed there too and many of us thought this was his last kick at the can but when it comes down to it there may not be a can left to kick. 8. There are some proposed rule changes surrounding the health of our players and the rolls of the referees and who and when penalties can be called. I'm all for progress. When you think of the end of the Riders season and the "I couldn't see" fiasco it was apparent something needed to be done besides adding more eyes on the field. It'll be interesting if all of this does indeed come to fruition. There you have it! Those are the 8 CFL Stories of March. What does April have in store for us? We will have to wait and see. 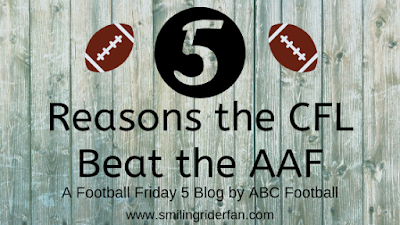 In the meantime, don't forget to check out ABC Football's Facebook page and if you'd like to have a fun discussion with some other passionate (and slightly crazy) Rider fans, search and join ABC Rider Fans. When the 2019 season begins, we all want to know all the latest news and I don't know a of better way to get involved.